Global National Australia is the parent company of Techniice and its associated brands. Techniice Australia owns the brand Jungle Reef Outdoors, who manufacture quality camping gear for outdoor enthusiasts. Techniice have been in business for over 25 years, guaranteeing a quality product for years to come. Our sleeping bags are made from the highest quality materials available on the market today. People who spend a great deal of time outdoors have an appreciation for the sleeping bags that we offer. They also pack down to a small size for transport, whether you are hiking, on the boat or in the car. Whenever people go camping, the weather often gets cold. Overnight minimums can be enough to put off many adventurous people from the idea of camping. This is no longer an issue, as our sleeping bags offer a -6 degree rating. Warmth and comfort are assured for our customers, who are able to experience the fun of the outdoors and easily take on the chilling temperatures. The size of a sleeping bag is also important, to be certain of its usefulness to all sizes of people. This is not an issue for Jungle Reef sleeping bags, which come in a range of sizes to satisfy a wide range of customers. There are also sleeping bags that offer zero degrees comfort, assuring your summer camping trip can be just as enjoyable as in winter. Another feature to extend the usability of your sleeping bag is the double zip line. By opening up the sleeping bag it will become a double doona. Increasing the worth of your sleeping bag is its ability to be joined to another to create a double sleeping bag. This is great for couples who don’t like to be separated. The quality of Jungle Reef sleeping bags ensures they last a long time. The outer fabric is made up of 230T rip stop fabric to prevent any tears from spreading. This is complemented by 100% flannel lining. 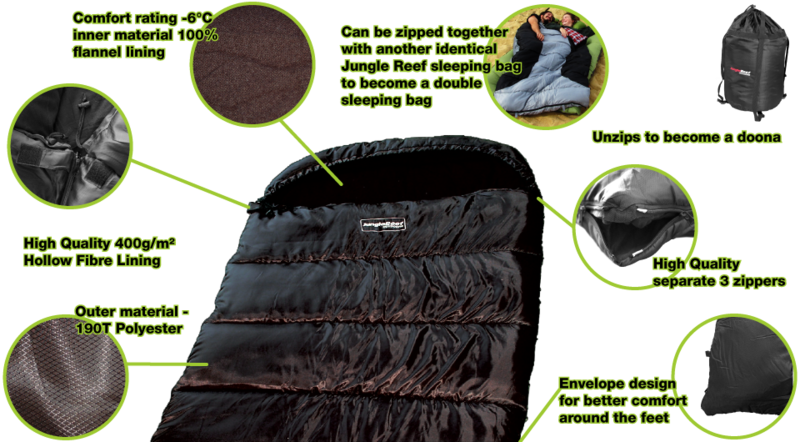 The sleeping bag itself has a high quality 400gsm rating, and is manufactured to endure the great outdoors. If you’re looking for a product with quality from a reputable supplier, look no further. Technice, run by Global National Australia, are a highly regarded business both nationwide and abroad. You can trust that Jungle Reef Outdoors are all about providing excellent products to valued customers nationwide and abroad for many years to come.